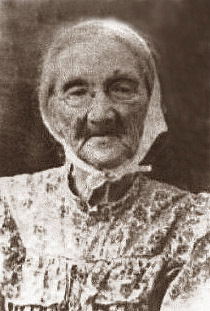 Mary Jane Thomas was born about 1826 in Decatur County, Georgia and died on August 25, 1919 in Geneva Co., Alabama. Actual date of birth is unknown. She lived to be about 93 years old. Family # 32, FB Patterson (age 24), wife, Mary (age 18),John (age3) William (age 1) F. B. states he is a farmer, he was born in LA. Mary was born in GA and the children were born in AL. Mary Patterson (age 69) is listed as the head of household consisting of Daniel (age 23, son), Louis (age 20, son), Boxy Ann (age 19, daughter) and Sophronia (age 16, daughter). Both boys are listed as laborers and the women as "keeping house". Mary states that she was born in Georgia and both parents were born in AL. The family of Thomas Patterson is listed immediately below Mary and her family. 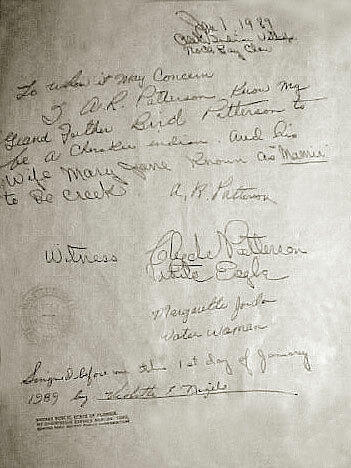 To whom it may concern -- I, A. R. Patterson know my grandfather Bird Patterson to be a Cherokee Indian and his wife, Mary Jane known as "Mamie", to be Creek. signed A. R. Patterson. Witness: Clyde Patterson- White Eagle, Margaritta Jordan- Water Woman. 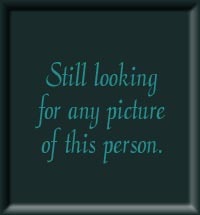 Notarized: Signed before me this 1st day of January 1989 by Violetta Nigels. Click on any of the News, Events, or Discoveries buttons above to see historical things that happened during Mary Thomas's life. These are only some of the major events that affected the life and times of Mary, her family, and friends. For example, Mary is 4 years old when Indian Removal Act signed and the moving of eastern Indians west of the Mississippi begins. 9 1835 Alabama gold rush begins in the east-centrl hill country. 11 1837 The Second Creek war begins in 1836. In 1837 The Battle of Hobdy's Bridge becomes the last indian battle in AL. 14 1840 Alabama reports a total population of 590,756 on the 1940 Federal Census. This includes 335,185 whites, 255,571 blacks, 253,532 slaves, zero Native Americans, and others. 24 1850 State population=771,623. The 1850 Federal Census reveals the White population=426,514; African-American population=345,109; Slave population=342,844; Free black population=2,265; Urban population=35,179; Rural population=736,444; Cotton production in bales=564,429; Corn production in bushels=28,754,048; Number of manufacturing establishments=1,026. 79 1905 Crisp, Grady, Jenkins, Tift, Davis, Stephens, Toombs, Turner, and Ben Hill Counties formed. 86 1912 Forsyth, Bleckley, and Wheeler Counties formed. 88 1914 Barrow, Candler, Bacon, and Evans Counties are formed. 91 1917 Atkinson and Treutlen Counties are formed. 69 1895 Wireless telegraph and the "antenna" are invented but it covers a very short distance. 74 1900 Freud publishes his book "The Interpretation of Dreams"
74 1900 The cause of yellow fever is discovered. It is proven that the fever is spread by mosquitoes. This rallies an effort to provide better mosquito control. 75 1901 First transatlantic wireless telegraph is sent. 76 1902 The first Tyrannosaurus Rex fossil is discovered. 86 1912 The unsinkable Titanic sinks on its first trip to New York drowning 1,513 people. 86 1912 White residents of Forsyth County, GA, drive the black population out. 91 1917 NEWS HEADLINES: In June, the United States enters World War I on the side of the allies. The Russian Revolution ends the reign of the czars and thrusts Russia into communism. 93 1919 NEWS HEADLINES: World War I ends with the signing of The Versailles Treaty. 84 1910 Boy Scout and Girl Scout Organizations are introduced in America and the concept of a "week end" meaning time off from regular work begins to take root. The British Empire covers 1/5th of the world land area. 88 1914 World War I - Following the crisis touched off by the assassination of Archduke Ferdinand of Austria in Sarajevo, Germany declared war on Russia and additional countries joined the war within several days. 91 1917 Germany uses airplanes to drop bombs in the early stages of World War I -- the first major military use of airplanes. 93 1919 The Versailles Treaty marks the official end of World War I. 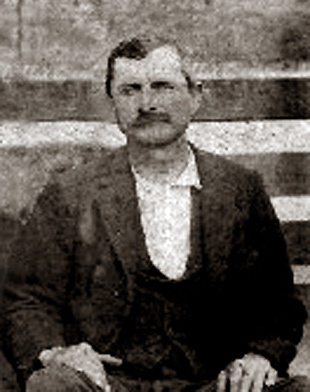 Born in Dale Co., on March 6, 1847 and died in Geneva Co., Alabama on January 18, 1890. He was 42 years old. 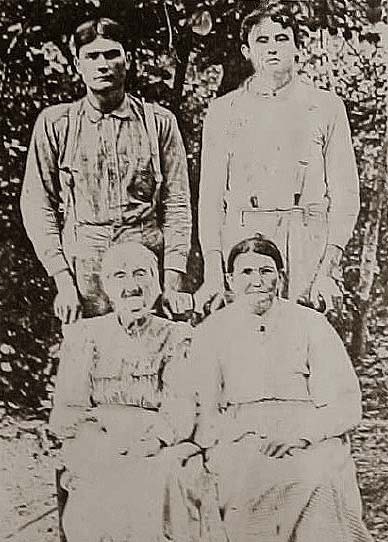 Born in Geneva County, Alabama on January 25, 1848 and died in an unknown location about 1903. He was about 54 years old. He married Samantha Byrd (4/25/1857 -1/18/1939). 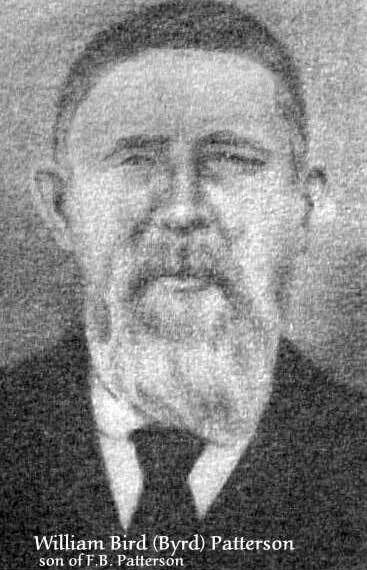 Born somewhere in Alabama on April 9, 1850 and died somewhere in Texas on March 7, 1937. He was 86 years old. 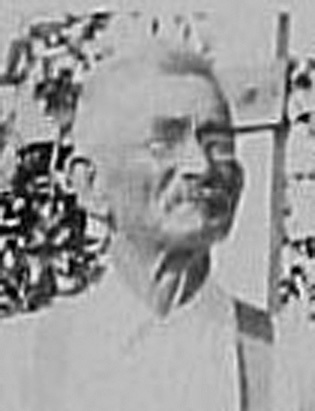 Born in Geneva Co., Alabama on December 24, 1853 and died in Geneva Co., Alabama on January 9, 1944. He was 90 years old. 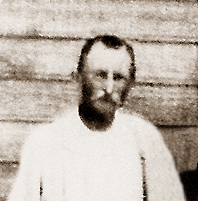 Born in Geneva County, Alabama on April 10, 1855 and died in Dale County, Alabama on January 28, 1930. He was 74 years old.